The big white group at the top still does not have eyes. At the same time White managed to bring trouble home. Within the next 10 moves White made the situation desperate, allowing Black to split her forces into many separate groups while allowing Black's groups to connect. 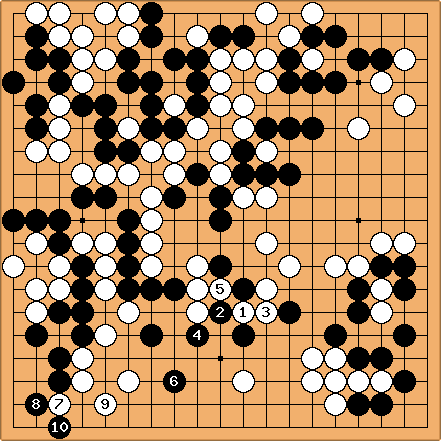 White 1 cuts off a group of black stones in the center and now secures a life for a big dragon. But the price is too high. White had to keep calm. First of all there is always a ko at the top. Second the most important issue was to keep the groups connected. Black 2 is a natural reply and White connects at 3 threatening to cut at two points. Black cleverly defends one of the cutting points with 4 and White 5 takes another. Now several black stones in the center are doomed. 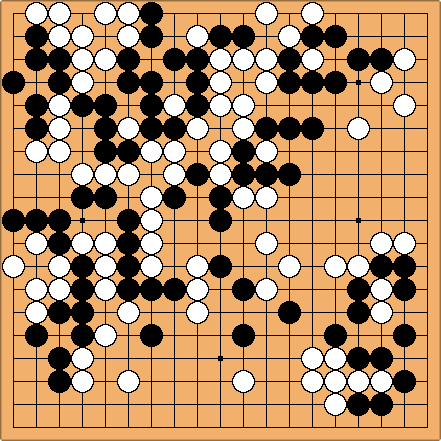 But Black gets 6, separating White's group at the bottom. White brought the trouble home. White 7 is an attempt to survive by threatening Black's corner. Black replies with 8 naturally and White tries to create an eye shape with 9. Black 10 naturally destroys an eye.